e-cat – COLD FUSION NOW! A New Kind of Nuclear Reactor? by Guest Author Dr. Ludwik Kowalski, Montclair State University, in which Dr. Kowalski dives into the Parhomov experiment and makes sense of the particulars for the general reader. Read the original article posted here on Dr. Kowalski’s cold fusion archive. d) Uranium and thorium seem to be the only suitable fuels, in any kind of energy multiplier. Why is it so? Because fission is the only known process in which more than 100 MeV of nuclear energy is released, per event. This number is about four times higher than what is released when two deuterons fuse, producing helium. Will more efficient fuels be found? If not then chances for replacing coal, oil, and gas by a Parkhomov-like fuels are minimal. Find more on Ludwik Kowalski’s cold fusion archive. A report released Wednesday on a test of the E-Cat Energy Catalyzer concludes a large amount of heat was generated using a fuel of one gram of nickel powder, with no radiation detected at all. The paper was authored by scientists who had performed tests on an earlier version of the E-Cat, releasing the report Indication of anomalous heat energy production in a reactor device containing hydrogen loaded nickel powder [.pdf] last year. During one November, 2012 experiment, the E-Cat generated so much thermal power, it melted the steel inner core body and the ceramic casing. This second test purposefully kept the input power moderate to ensure a longer life for the newly designed E-Cat. As in the previous test, David Bianchini monitored radiation from the unit “before, during, and after operation”. 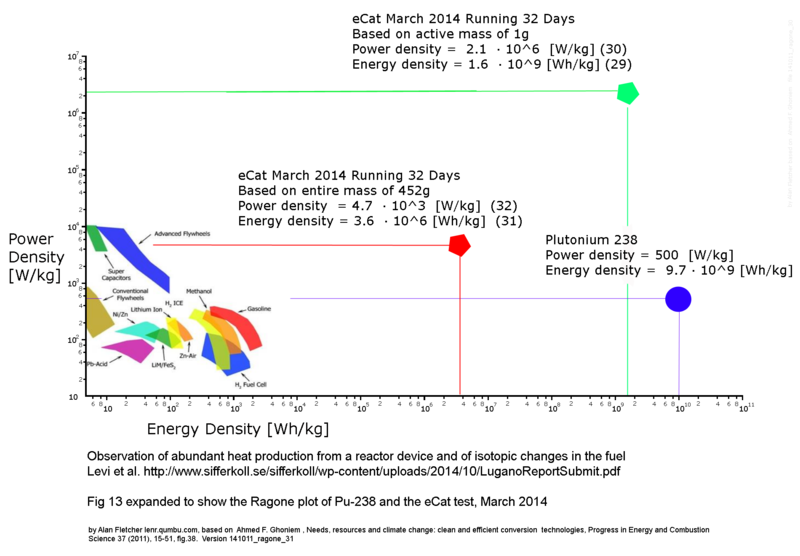 No radiation was reported from the E-Cat, or from the fuel charge. Over the last year, E-Cat intellectual property and licensing rights were acquired by private company Industrial Heat, LLC, an affiliate of Cherokee Investment Partners, with investment in the project reported at over $10 million. The group has retained inventor, designer, and Chief Engineer of the E-Cat, Andrea Rossi to lead the development of the energy generator. Andrea Rossi participated in the experiment by fueling, starting the E-Cat, stopping the E-Cat, and removing the fuel from inner chamber. At these times, members of the evaluation team were present, and observing the activity. The report was organized into sections with the lead authors writing the Abstract and main body of the report. Five other authors contributed four appendixes describing radiation monitoring and fuel analysis, including scanning electron microscope SEM and x-ray spectroscopy studies. Radiation measurements during the long-term test of the E-cat prototype. The E-Cat has undergone many design changes since 2011 when the public got their first glimpse of the Energy Catalyzer. Last year, the E-Cat appeared as a smooth, silicon nitride ceramic shell cylinder 33 cm in length and 10 cm in diameter, painted black. Inside was a second cylinder made of corandom, which contained resistor coils to heat the reactor with an “industrial trade secret waveform”. The innermost cylinder was made of steel, 33 mm long and 3 mm in diameter and contained the fuel charge of treated nickel powder with the secret catalyst. Design changes allowed for improved features, says the report. This year’s 2014 model E-Cat thermal generator can attain higher temperatures, while avoiding internal melting of the powder. To initiate and control the reaction, resistor coils surrounding the inner fuel cylinder heat up from “specific electromagnetic pulses”. The authors report the reactant is a micron-sized nickel-powder mixture and that once heated, “it is plausible” that a lithium hydride delivers the hydrogen fuel for the reaction. Last year, the E-Cat had a cyclic input power, which appeared to regulate the heat-producing reaction. On one end of this year’s new bone-shaped generator, a hole that allows for re-charging of the reactant also holds a temperature sensor that sends data to the controller. If the inner chamber gets too hot, the pulse is dialed down. As in the previous test, heat was measured by thermal imaging and computing the convection away from the surface of the generator. Two thermal image cameras mapped the heat data of the generator across its surface as the E-Cat operated. Thermal imaging is a well-developed technology with a strong track record in many applications, but not in the field of cold fusion, which has relied on calorimeters and direct contact thermocouples. Optical photo of new model E-Cat in operation. An empty E-Cat played the dummy to check that power in would match power out, as was observed. The infrared camera’s temperature readings were converted to radiant power in watts by the Stephan-Boltzmann formula, an equation with parameters dependent on the emissivity ε of the material as well as the temperature. The outer shell of 99% alumina was divided into sections, and ε assigned to each area. Plot 6 shows a graph of the Net Power Out. The horizontal axis marks every two days and the vertical axis showing average Watts produced. Net Power Out is the power produced by the E-Cat, minus the power inputs, and shows the amount of watts generated solely by the E-Cat. As described in the report, after the first ten days, the input power was lowered by the controller. The team then decided to increase the input power about 100 Watts, which over six minutes, activated a large jump in temperature, equating to a net thermal power output of about 2.3 kilowatts. At peak usage, a large home may require 1-3 kilowatts electrical power. The area under the graph over the next twenty-days represents just over 1 Megawatt-hour of energy. According to the report, the total energy produced over the month of testing was a remarkable 1.5 MWh generated from 1 gram of nickel-powder fuel. Thus, E-Cat energy density – 1.6 billion +/- 10% Watt hours/kilogram – is much greater than any energy derived from the chemical burning of gasoline, oil, or coal. Last year, E-Cat test COPs at or below three, with values of 2.9 +/- 0.3. This year, COP was computed as well over 3, even though the device was said to not have operated at maximum output. It has been stated many times that a COP > 3 makes a commercially-viable energy technology. Read David French’s explanation of COP here. Of the 1 gram total in the reactor, a 10 mg sample was removed from the reactor and analyzed for content. Materials analysis revealed natural nickel grains of a few microns in size as the bulk of the material. Other elements included Lithium, Aluminum, Iron, and Hydrogen. “Large amounts” of Carbon and Oxygen were also found. But after the reaction, the ash had a “different texture than the powder-like fuel by having grains of different sizes”, and there was an unusual and unexpected shift in isotopic composition for the Nickel and Lithium grains. The Lithium content in the fuel is found to have the natural composition, i.e. 6Li 7 % and 7Li 93 %. However at the end of the run a depletion of 7Li in the ash was revealed by both the SIMS and the ICP-MS methods. In the SIMS analysis the 7Li content was only 7.9% and in the ICP-MS analysis it was 42.5 %. This result is remarkable since it shows that the burning process in E-Cat indeed changes the fuel at the nuclear level, i.e. nuclear reactions have taken place. Another remarkable change in the ash as compared to the unused fuel is the identified change in the isotope composition of Ni. The unused fuel shows the natural isotope composition from both SIMS and ICP-MS, i.e. 58Ni (68.1%), 60Ni (26.2%), 61Ni (1.1%), 62Ni (3.6%), and 64Ni (0.9%), whereas the ash composition from SIMS is: 58Ni (0.8.%), 60Ni (0.5%), 61Ni (0%), 62Ni (98.7%), 64Ni (0%), and from ICP-MS: 58Ni (0.8%), 60Ni (0.3%), 61Ni (0%), 62Ni (99.3%), 64Ni (0%). We note that the SIMS and ICP-MS give the same values within the estimated 3% error in the given percentages. Possible reaction pathways to these stunning results are provided in the report, but the authors caution that “reaction speculation above should only be considered as an example of reasoning and not a serious conjecture.” There is as yet no explanation for these findings. The E-Cat has attracted financial investment, and inventor Andrea Rossi has given rights to the technology to private company Industrial Heat. They are in to win. Engineering changes are improving control of the reaction and the E-Cat is shrinking in size, now down to a breadstick. While discussion of procedure and parameters continues, it won’t change the fact that we are within epsilon of a revolution in energy technology. Whether it is the front-running E-Cat, or another start-up that finds the right recipe, the E-Cat test report gives a peek at what is possible to achieve. On multiple occasions, the E-Cat has publicly demonstrated steam, heat, and energy, once producing one-half megawatt power. Even if the net power out were 50% less, this E-Cat test run would still be making excess heat. Global research, as presented at these conferences here and here, is focused on understanding the science, and finding a theory to describe this newly discovered phenomenon. Swedish research and development institute Elforsk, a partial sponsor of the test along with the Royal Swedish Academy of Sciences, will begin a ‘research initiative’ as stated by Elforsk CEO Magnus Olofsson. Companies like Industrial Heat and men like Andrea Rossi are pushing the frontiers of engineering to create a product to re-make the world. Safe, non-polluting, with the energy-density to free a planet from the present destructive paradigm, there is nothing that will change our world more than new energy technology. Renewing a civilization by empowering local communities, restoring our wildspaces and the wildlife that lives there, powering the hot tub in my backyard (that’s not my backyard in the picture), we are at the break-boundary. Are you ready for Apocalypse??? Ask questions of the authors at LENR-forum.